One of the biggest hidden challenges when it comes to developing eLearning is getting feedback from your client, collaborating on course content with internal team members, or getting final project approval. Sure, you can manage the collaboration or feedback process the old fashioned way--email. However, managing dozens upon dozens of project emails can quickly become a daunting task. Even if you're successful in managing the email strings, if your boss or client asks you to summarize the comments that were approved or rejected, re-reading the emails is likely going to be next to impossible. One possible solution to this conundrum is ReviewLink, an online tool that lets eLearning developers host published courses and manage feedback--all in one place. Best of all: you can use ReviewLink with Adobe Captivate, Articulate Storyline, or Lectora. Your manager, stakeholders, and subject matter experts can provide feedback directly on any page of a course. Each comment has a status--New, Fixed, OK, Not OK, or Archived--so you can easily keep track of your progress. Thanks to ReviewLink, one company (Axcess Financial) reports saving 80 maintenance hours each year and trimming 12 weeks off of the review process. According to an Axcess Financial rep, "ReviewLink's cloud-based collaboration and easy content management contributed to a high level of efficiency, reduction in errors, and hours of time saved." Above and beyond the review and collaboration time savings, ReviewLink can also also be used for beta testing with small groups of learners. For instance, The Centers for Disease Control and Prevention (CDC) used ReviewLink to run a course pilot. By using ReviewLink, the CDC allowed multiple reviewers to share their opinions while keeping their comments hidden from each other. This prevented one reviewer's opinion from influencing another's first impression of the course. As I mentioned above, you can use ReviewLink with Lectora, Storyline, or Captivate projects. If you are using Lectora, you can upload directly to ReviewLink from within the tool. 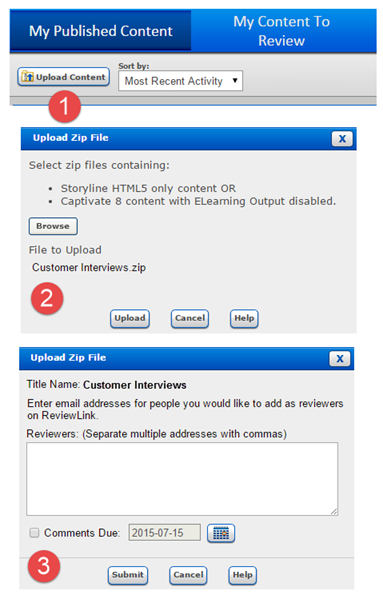 Storyline and Captivate developers need to first publish the content and then upload the content into ReviewLink. 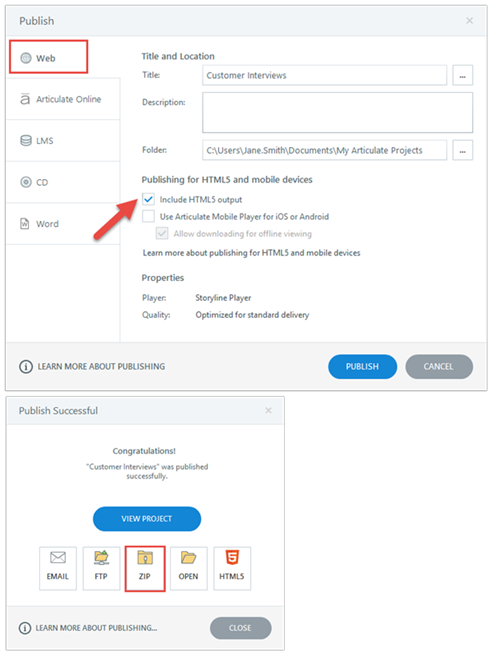 In Storyline, simply publish courses to the web with the Include HTML5 Output selected. When publishing, select ZIP. 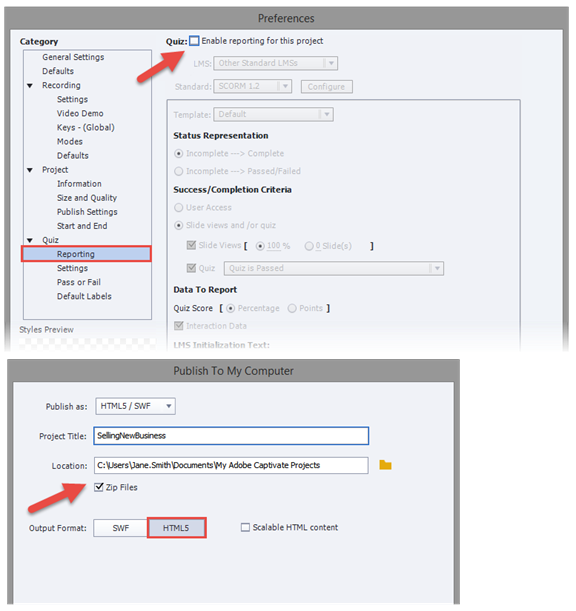 In Captivate, turn off Quiz Reporting when publishing. When publishing, select Zip Files. Next Time: The ReviewLink workflow. You can download a free trial of ReviewLink here. Normally the review period lasts for 30 days. 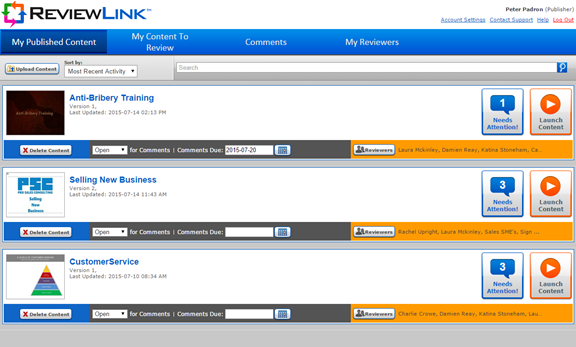 However, if you sign up for the ReviewLink trial now, you will receive an extra 30 days for free.